One for all you clerical dress nuts. Edward Finch was rector of Christ Church in London and was well known for his Laudian leanings. 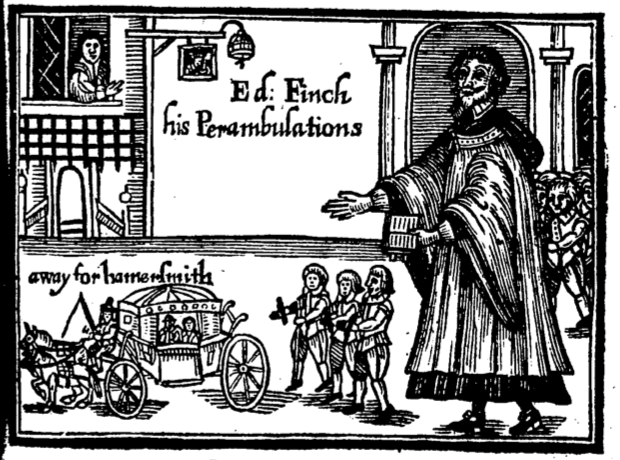 Hence he drew the attention of Parliament and was charged with popish practices. He’s drawn perambulating through his parish wearing a rather splendid surplice, one of those Laudian trappings of the established church so hated by the Independants. It’s a rather nice one, big sleeves and a fancy band around the top. Notice his university hood hanging down his back, over the surplice.